At first glance the Sony 50mm f/1.8 model number SEL50F18 looks like a solid, albeit pretty vanilla lens. Built for the E-mount, the lens is compatible with APS-C cameras like the α6300 and α6000 giving you an angle of view that roughly equates to a 75mm on a full-frame camera. That makes this 50mm f/1.8 more like a lightweight, fast, short telephoto. Combine that with the very reasonable $299 price point ($249 during the Semi-Annual α Lens & Accessory Promotion) and you’d have an affordable, reliable performer in your bag. The SEL50F18 has something that you won’t often find on a sharp 50mm prime—Optical Steady Shot image stabilization. And that turns a lens originally released in 2011 into a sleeper on today’s α6000 and α6300 where it excels for shooting everything from travel to weddings and portraits. The lens is ruggedly built and the AF mechanism is extremely quiet making it ideal for still photographers who prefer not to draw attention and for 4K video on the latest Sony α6300. The fast f/1.8 aperture gives you a lot of low-light opportunities and the and one cosmetic bonus, for a lens that originally came out for the NEX line is its availability in basic black or a retro-looking silver. It’s a true sleeper in the line and a no-brainer for APS-C shooters. And of course, you can use it on full-frame Sony α7-series cameras in crop sensor mode as well (just one of the many benefits of mirrorless design). When changing your aperture to defocus the background, the light sources appear blurred. This ‘bokeh’ effect of the blurred background can be enhanced with circular aperture blades used in this lens. Conventional aperture blades have flat sides creating unappealing polygonal shaped defocussed points of light. α lenses overcome this problem through a unique design that keeps the aperture almost perfectly circular from its wide-open setting to when it is closed by 2 stops. Smoother, more natural defocusing can be obtained as a result. 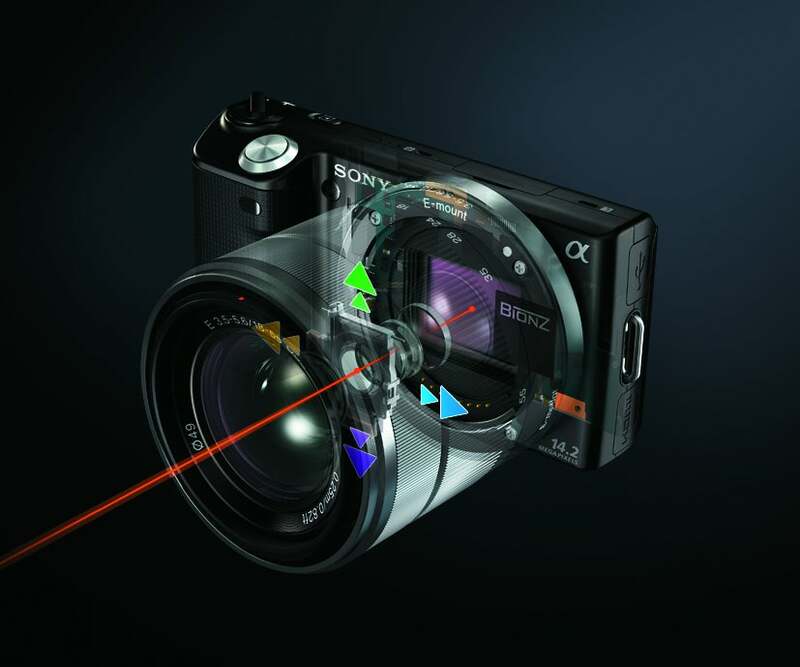 Gyro sensors built into the lens detect even the slightest movement, and the stabilization lens is precisely shifted to counteract any image blur that might occur. The use of precision, quiet linear motors and technology inherited from high-end Sony professional camcorders results in exceptionally quiet, effective image stabilization that contributes to high-quality movies as well as stills.